And thus begins another season of San Francisco Little League baseball…. I’ve just returned from 90 minutes with my new group of fresh-faced, mostly 8 year-olds. Best 90 minutes I’ve spent in recent memory. Felt more like 15 minutes. Maybe fewer than that. Not nearly long enough. I’ve been coaching Little League now for something on the order of 14 or 15 seasons. I can’t believe I get to do this year after year. It has become a big part of who I am. By now, I have a decent handle on the car trunk full of the requisite gear: polyester jerseys, rationed-out bats, helmets and first aid kits. All of which will fill my trunk and hurt my gas mileage for the next few months. – One white plastic bucket that used to hold paint or maybe plaster or stucco. Now it holds approximately 55 baseballs accumulated over the course of the aforementioned seasons coached. These 55 balls are the backbone of our season. They will suffer through rain, cold, mud, fog, regular beatings from metal bats and from my wooden fungo, and hopefully some baking sunshine on occasion. 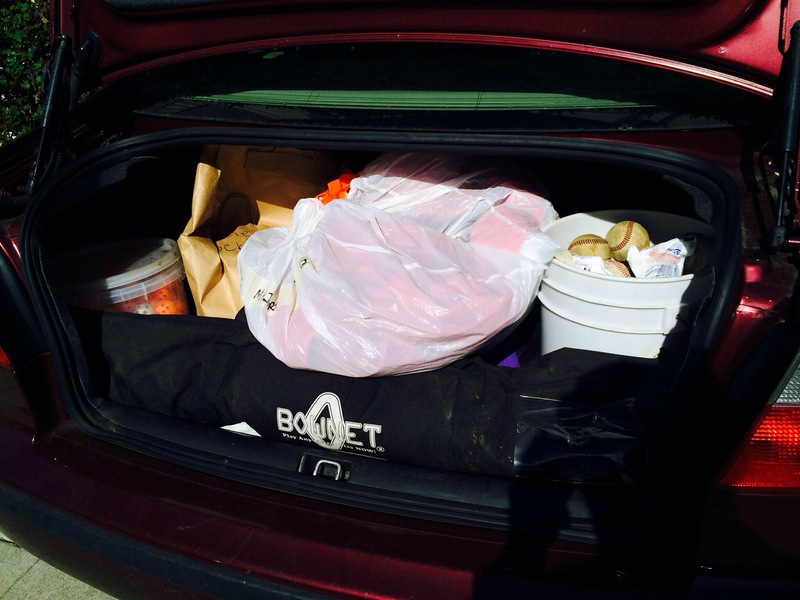 They will generally be stuffed into the plaster bucket, musty canvas bags, and dark car trunks, unceremoniously. With nary a complaint. But they will never be left behind, forgotten about in the high grass after a long practice or chaotic late-inning frenzy. I have a strict “No dun sphere left behind” policy. Some of the 55 in my bucket have been in the mix since my 12 year-old was a 5 year-old. Some have been scarred by permanent black-markered letters. A “B” to distinguish our balls from others’, for sure. A couple tattooed with “Nice Catch!” or “My Man!” As Max grew older, I’d hit high and l-o-n-g fly balls to him in the outfield at a park near our flat. Just the two of us. I’d scribble one phrase or another on the ball, toss it up with my left hand and crush it with a wooden bat gripped by my 2 hands. Max would manage to corral it (or not), and read my message scrawled between the seams. Big smile, visible even from deep in the outfield. This is good stuff, and pulling these particular old balls up from the bottom of my bucket, unexpectedly during a practice years later, feels pretty damn good. – One 45 year-old right-shouldered rotator cuff. Has served me well over the years, and seems to be holding up surprisingly OK. Thankfully I wasn’t much of a pitcher as a kid, so I unwittingly managed to save my arm for my own kids some 30 years later. Over the course of a season (and I am coaching both sons’ teams), I reckon I will throw perhaps 40,000 “pitches” to kids weighing between 60 and 160 pounds. In about a month from today, this will start to catch up with me. My shoulder will ache. I’ll be in the habit of stuffing my back pocket with a dozen or so Advils at all times, and swimming in the Bay–about which I am truly passionate–will be painful. Each reach and pull with my right arm feels a tiny bit nauseating. I will gladly sacrifice the various parts of my right shoulder as the season wears on. What are those parts for, if not to bond with these boys, maybe teach them a few technical pieces here and there, but most importantly to teach them to love that bucket of balls as I do. And to appreciate what that bucket of balls will teach them (and me) over the course of the long season. So the Little League season is here. My bucket of red-stitched balls is ready. My shoulder is fresh. Bring it on, boys. Release the Hounds! Your father was a madman w/a chainsaw! Indeed he was. Probably still is. 🙂 Happy Birthday! There is nary a grander moment then to hit a baseball and touch ‘em all. While I realize many of us are thinking more about the slopes this winter. The sunny days have me thinking of the spring. Naturally, that means Baseball. It’s the end of winter and we are born again with new grass on the field. Philosophically, of course, baseball holds so much more than just a “sport” status. More so then any other sport, it connects us through the ages and reminds us of years gone by. It can be spoken about with your father or your father’s father and beyond. Words like “Get in front of the ball. Don’t step in the bucket. Choke up with two strikes” hold meaning through generations. Think about that for a moment. No sport connects with virtually the same game from 1891. This was a time before there was a US Open, before Football and before James Naismith thought bouncing a ball through a hoop indoors was a good idea. There were no movies, no radio, no internet. Yet, there was a young skinny kid name Cy Young hurling a ball at 90+ miles an hour not knowing that 120 years later another young kid named Timmy would be doing the same. Baseball is a throwback sport and yet, despite the lack of violence, excitement and whiz bang gadgetry, it still holds the fascination of this country. Why? Well, many reasons actually. Perhaps it’s the intricate ballet of skills involved. After all, brute strength in hitting matters little if proper form isn’t involved. And even then you aren’t a ball player. You also need to run and catch and throw and all of this has to be in the proper form. And did I mention that you still must do this in a smart manner or you will still strike out? Perhaps it’s because it’s the only sport where it’s both a team sport and an individual sport. . . at the same time . . . at the same moment. The pitcher vs the batter while also the team vs the batter. Perhaps it’s the wonderful intricacies of the game. It’s like chess but with all the pieces being fallible. Of course, many will argue it’s simply a matter of being the only game played outside in the summertime. Whatever the reason, I’m happy to say the four best words of the year. “Catchers and Pitchers Report”. Or in our case, it’s practice time. I’m thrilled to start out another season and as thrilled to start it with our friends the Beadlings. Keir, if your arm holds up as long as what’s left of my leg, we should have a great season.